188 New City Road, Glasgow. This was one of Thomas Reid's chain of public houses. To read more on the history of Thomas Reid Click here. 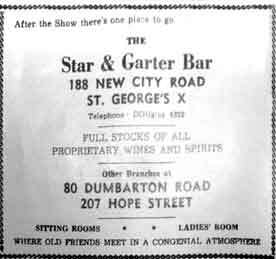 Advert for the Star & Garter. After the show there's one place to go. 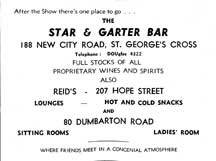 The Star & Garter Bar 188 New City Road, St George's X. Telephone Douglas 4322. Full Stock of all proprietary Wines and Spirits. Other Branches at 80 Dumbarton Road and 207 Hope Street. Sitting Rooms. Ladies' Room. Where old friends meet in a congenial atmosphere.